I already went to Portugal once earlier this year. Porto was amazing and I just had the best time! 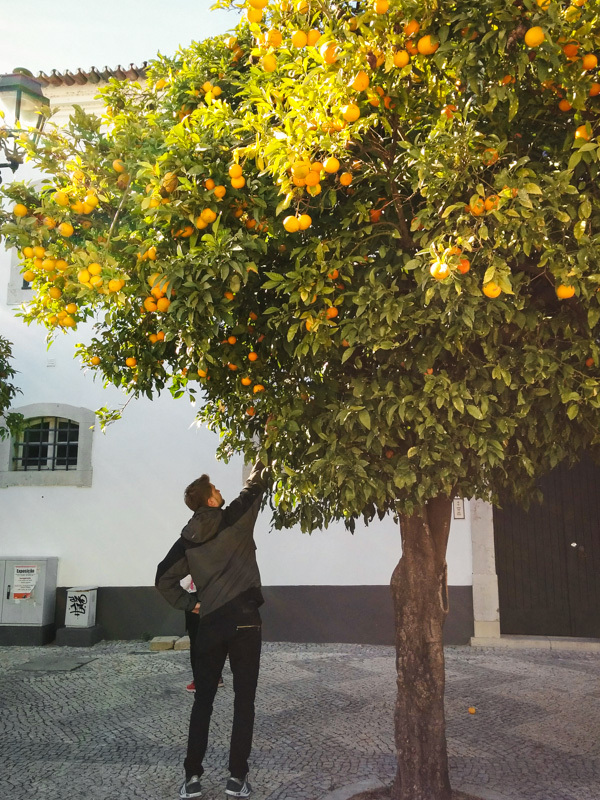 By coincidence I was watching Anthony Bourdain’s Parts Unknown episode about Porto somewhere during the late summer months and my first thought was “Damn, I would love to go back to Portugal”. So why not actually do it?! 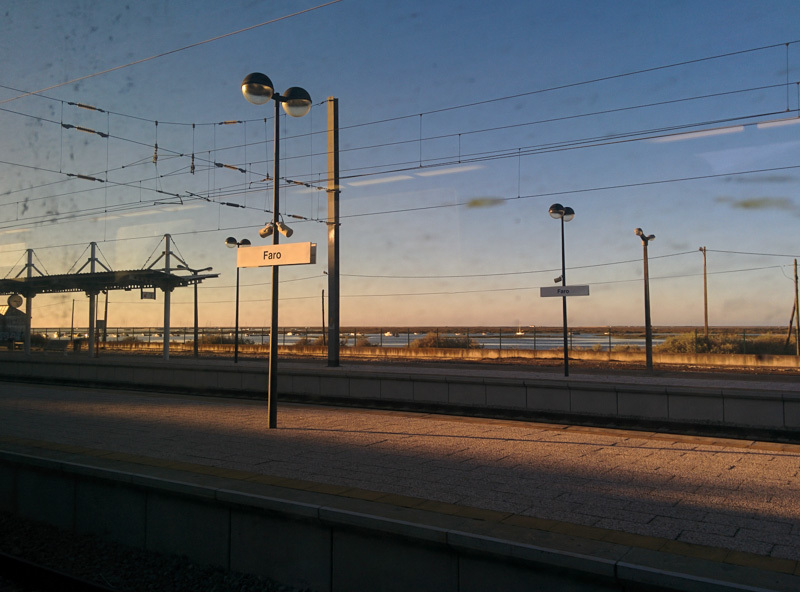 I booked a flight to Faro this time though, as I was never in the south of the country before. A quick chat with an old friend of mine and he decided to join for a few days as well! Good times guaranteed! 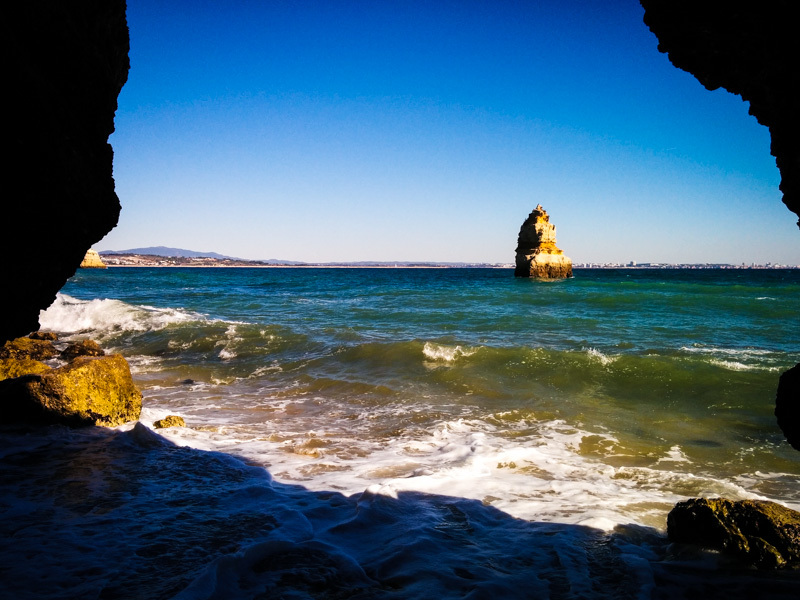 Portugal’s deserted beaches during the winter months. Erik, if you ever release a Christian rock album, this definitely needs to be the cover shot! 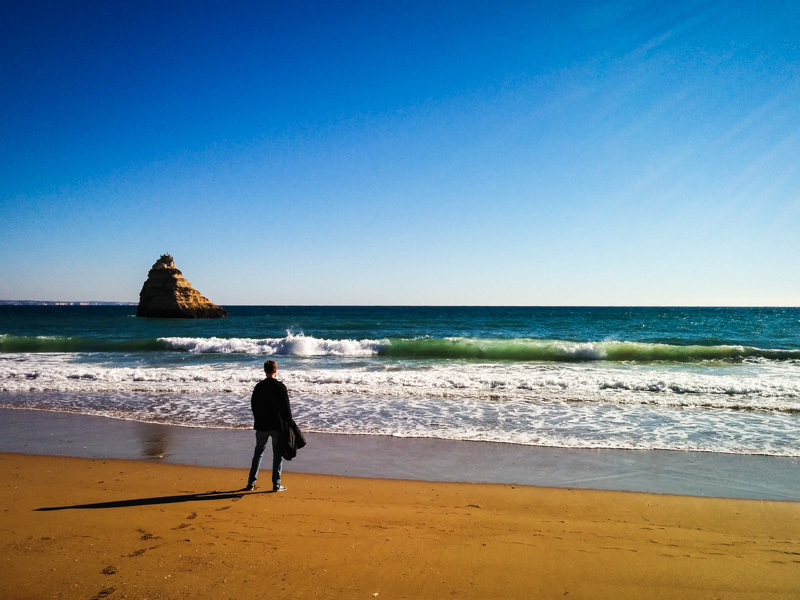 Before even heading to the Algarve region I asked some of my friends what to do when I end up there. Pretty much everyone advised me to head out into the nature, because the region is supposed to be really beautiful. 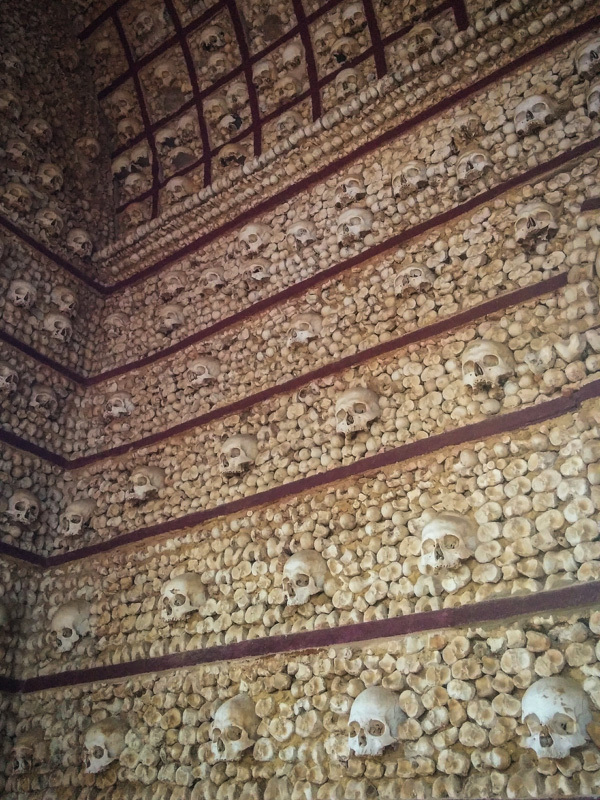 The first 4 days in the south of Portugal I spent together with my friend Erik. 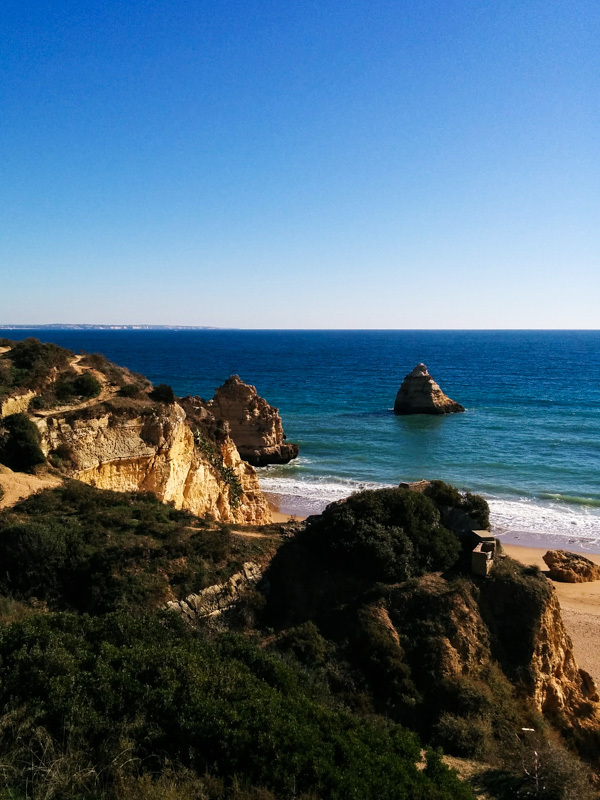 We took a day-trip west to Lagos and Portimao to check out the areas around Faro as well. 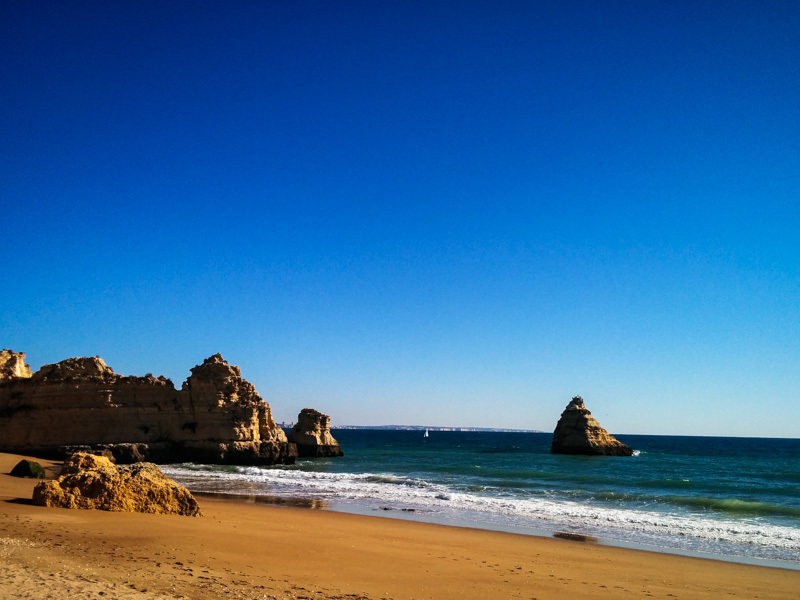 Beautiful deserted beaches, cliffs, caves and just the bluest sky possible. At the time I was here, it was 3°c at home and rainy snow was falling down on the poor people of Amsterdam. 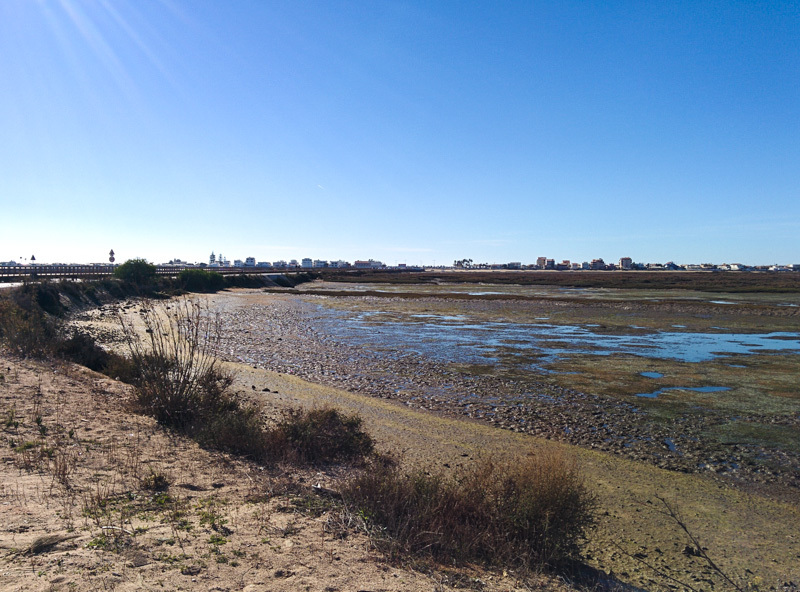 Closer to Faro there is also a nature preserve called Rio Farmosa. We booked a boat trip and as December is clearly off-season Erik and I had the whole boat to ourselves. Lucky for us we actually had two tour guides – one knowing everything about all kinds of birds and the other one knowing everything about the local fish. 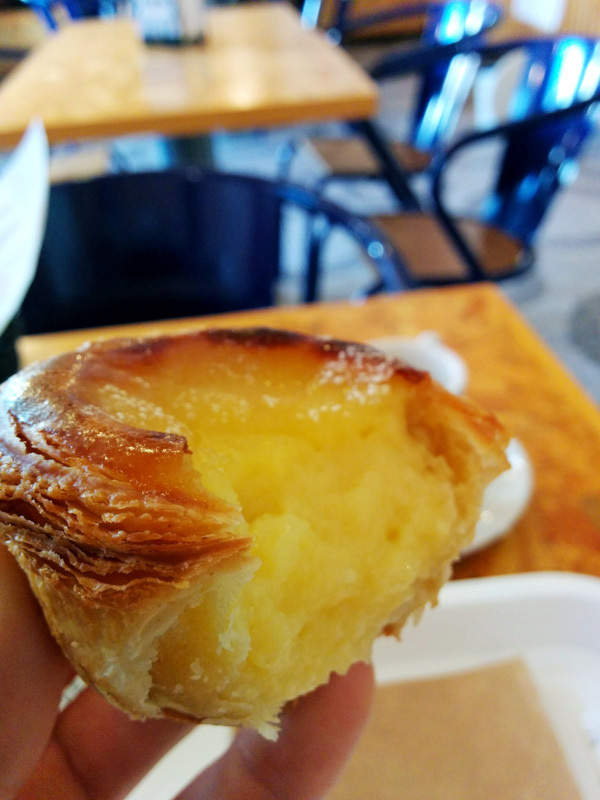 I came back to Portugal for the seafood and the pastries! 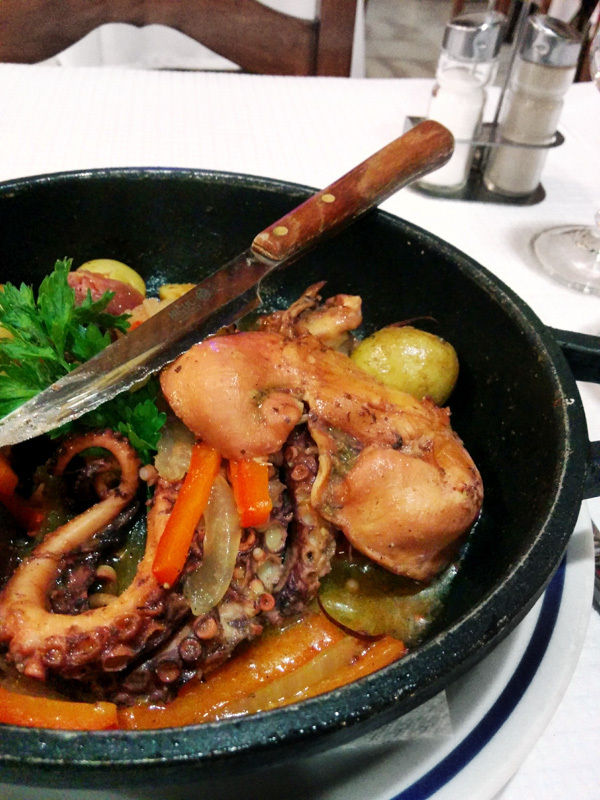 My main motivation to go back to Portugal was to enjoy the delicious fresh seafood again! Not a single day went by on which I didn’t had a nibble on some tasty sea creature. 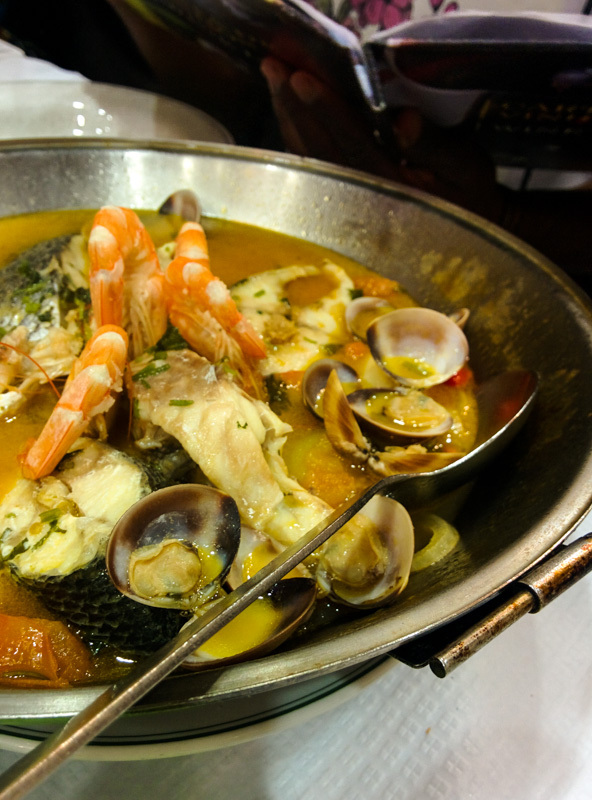 All the different small little bars and restaurants in and around Faro have scrumptious fresh seafood on their menus. Especially the restaurant “Duos Irmãos” was a great find! Their delicious seafood dishes made me come back 3 times during my stay. One of their dishes (the best one!) however didn’t make it onto a picture unfortunately. 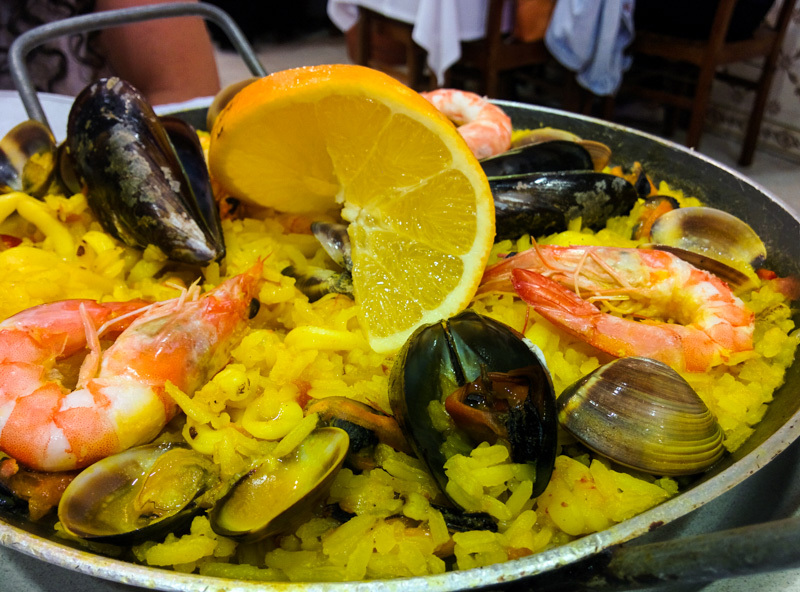 “Acorda de Mariscos” is a garlicky bread pudding topped with lots of prawns and mussels as well as a raw egg yolk. It looked amazing but as soon as it ended on the table the waiter started dissecting it and removed all the seafood toppings onto another plate in order to mix the raw egg yolk through the bread pudding. 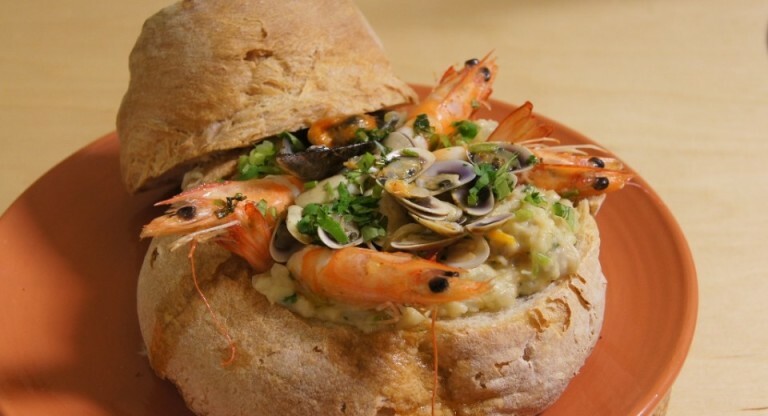 Afterwards the seafood makes its way back onto the bread stew. It was absolutely delicious but I felt a bit like the people in this video. Will definitely try to make this at home soon! 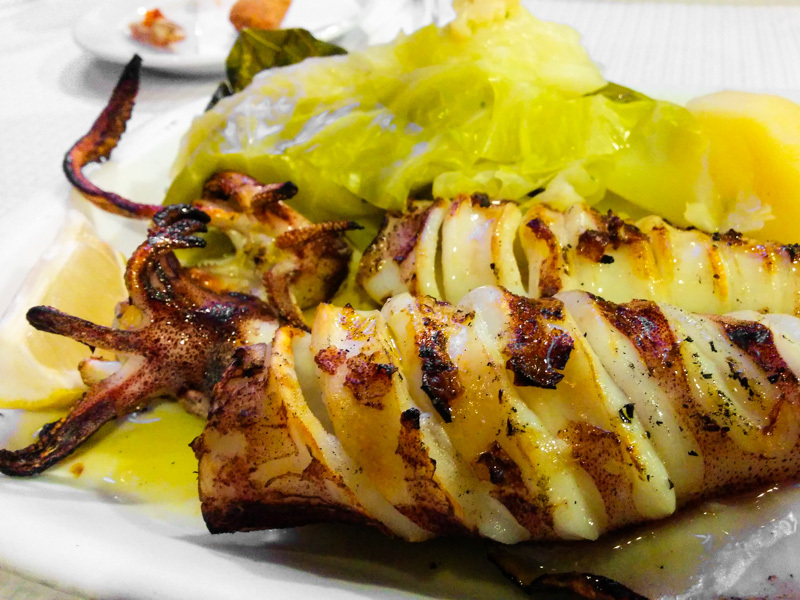 Photo of Acorda de Mariscos from OiPortugal because the waiter destroyed the beauty on my plate before I could take a picture of it; You can find the recipe for “Acorda de Mariscos” on their site as well! 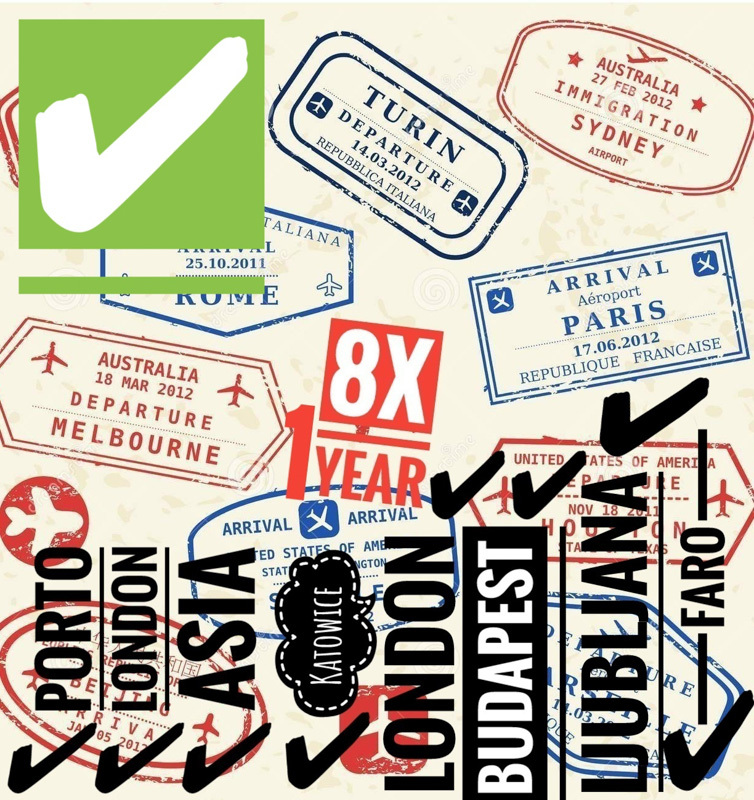 If you are traveling solo the hostel you end up in can often make or break your trip. 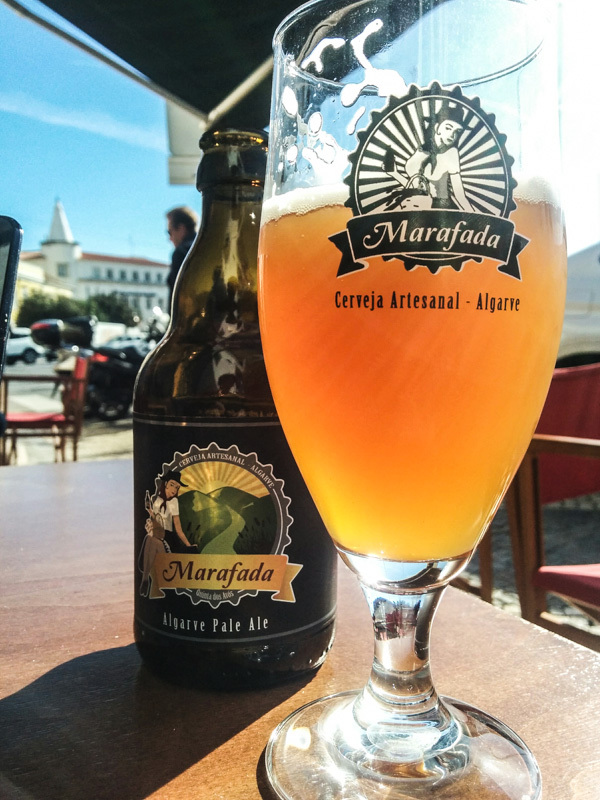 When I looked up hostels in Faro together with my friend Erik we ended up picking Casa d’Alagoa because of the quite positive reviews. In total I stayed 10 days in this hostel and the sure reason for that were the people. Not only are the visitors a quite interesting diverse crowd, but the staff is just so welcoming and makes you feel like you are part of their family. 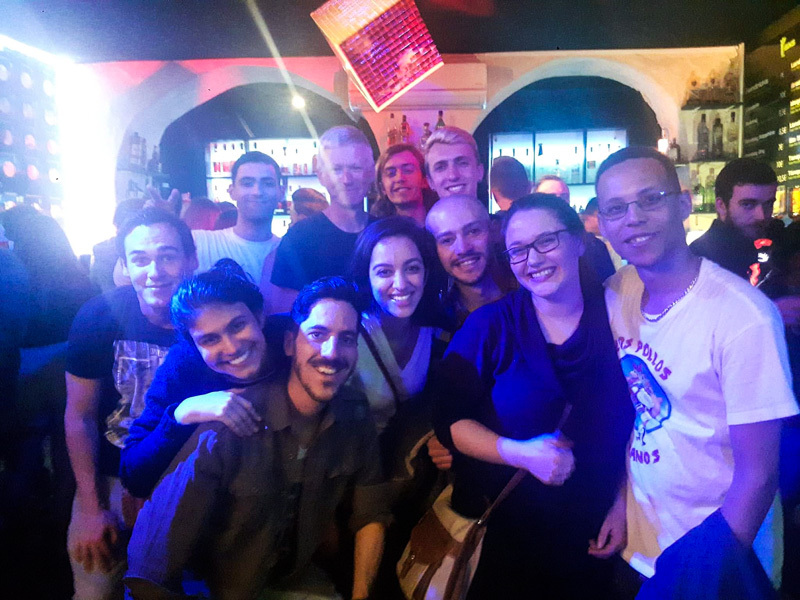 Rocky, Romulo, Ana, David, Myrella, Aurora, Thamy, Apostolis, Alessandro and Victor (+ everyone else I forgot…) all did such a great job to create a truly cozy atmosphere which made it really hard to ultimately say goodbye. So many fun dinners, so many fun nights out. 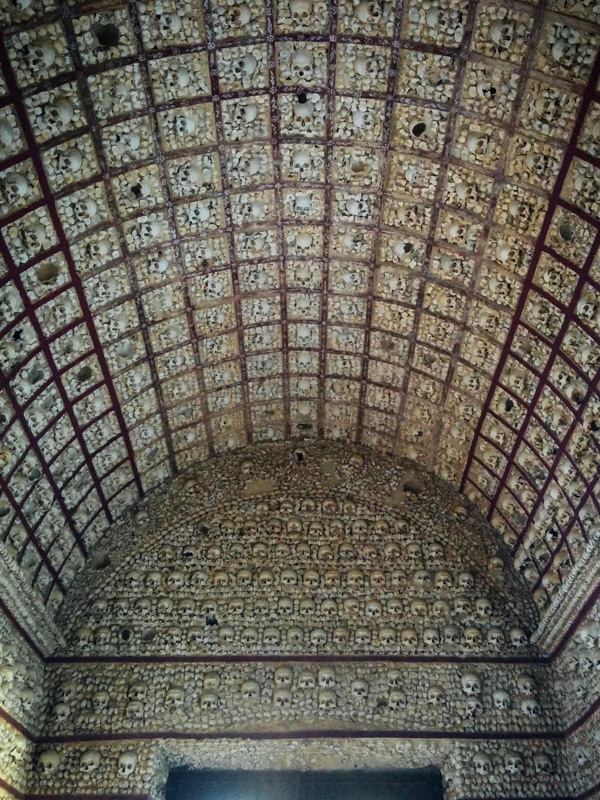 I’ve been to quite a few hostels in the last years, but this one easily takes 1st place! (2nd place goes to Pilot Hostel in Porto). I should have taken a group picture with you guys! If you ever end up in Faro I can recommend Casa d’Alagoa from the bottom of my heart. 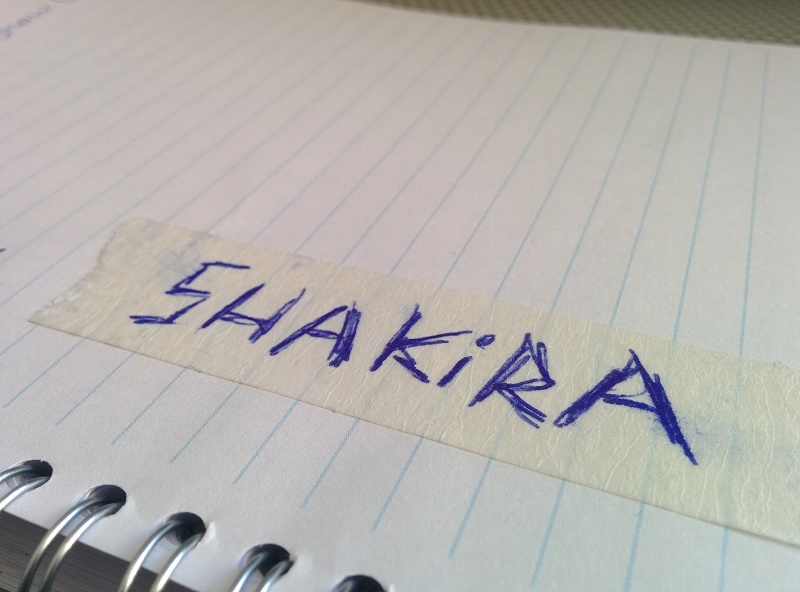 One of the most interesting places the hostel staff showed me was “A Fábrica dos Sentidos”. Feels like a flee market married a night club and I mean that in the best possible way. 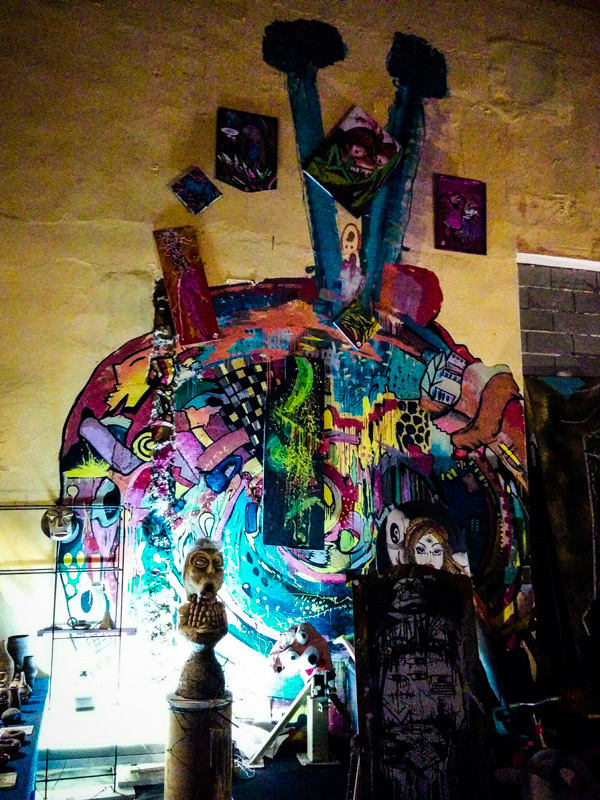 Really cool relaxed atmosphere and interesting stuff to find in every corner of the abandoned warehouse. 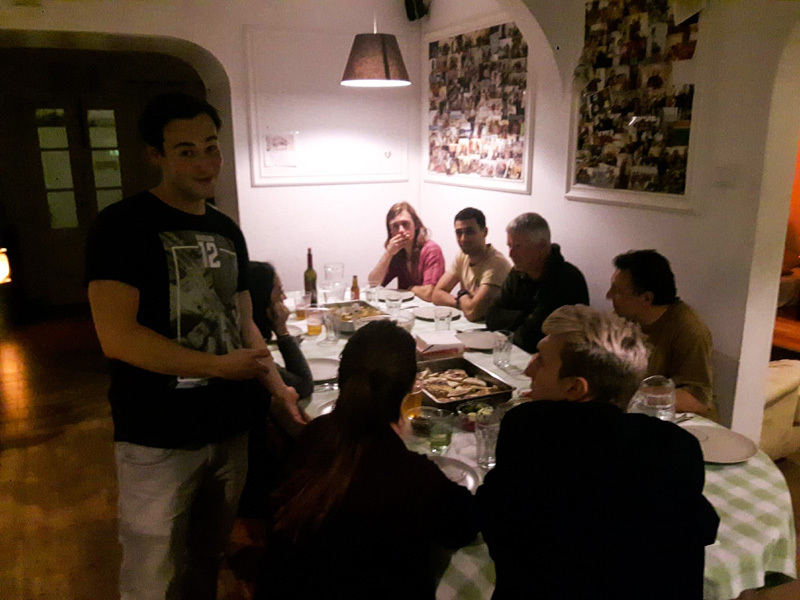 As I got to know the hostel staff better and better during my stay I was able to convince the assistant manager Rocky that he should give me a shot at taking over the kitchen of the hostel for a night serving a 3 course Mexican feast for the hostel guests. 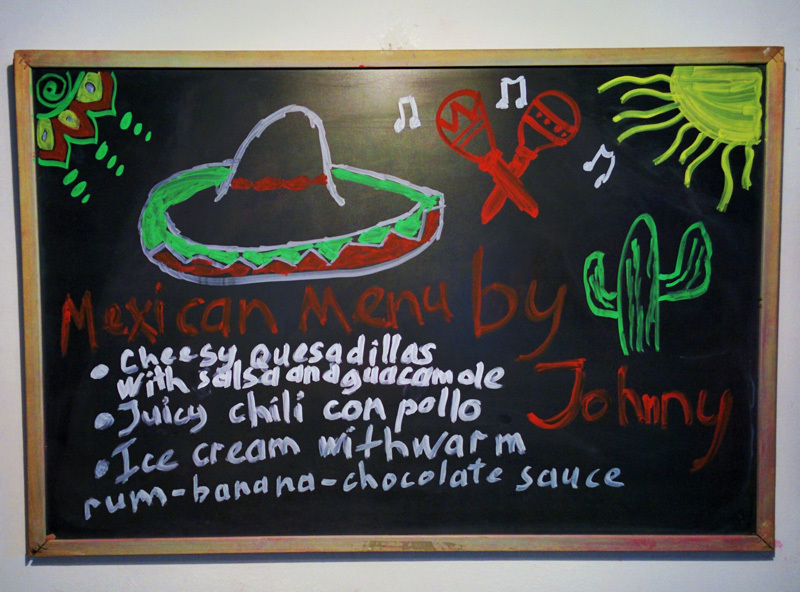 My dishes of choice are my all time Mexican favorites, meaning cheesy crunchy quesadillas with fresh pico de gallo salsa and guacamole, healthy chili con pollo, all finished off with ice cream in a warm chocolate-banana rum sauce – all from my book of course. We had quite some people showing up for the dinner (which included unlimited free drinks – that probably helped 😉 ). 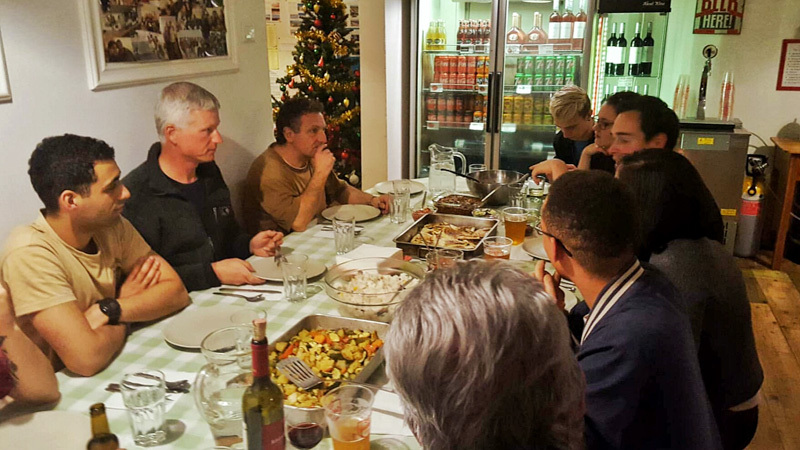 Filled stomachs and happy faces after dinner proved that these choices were definitely the right ones. My first little popup restaurant with actual paying guests was a full success! Thanks again Rocky for giving me a shot at this! 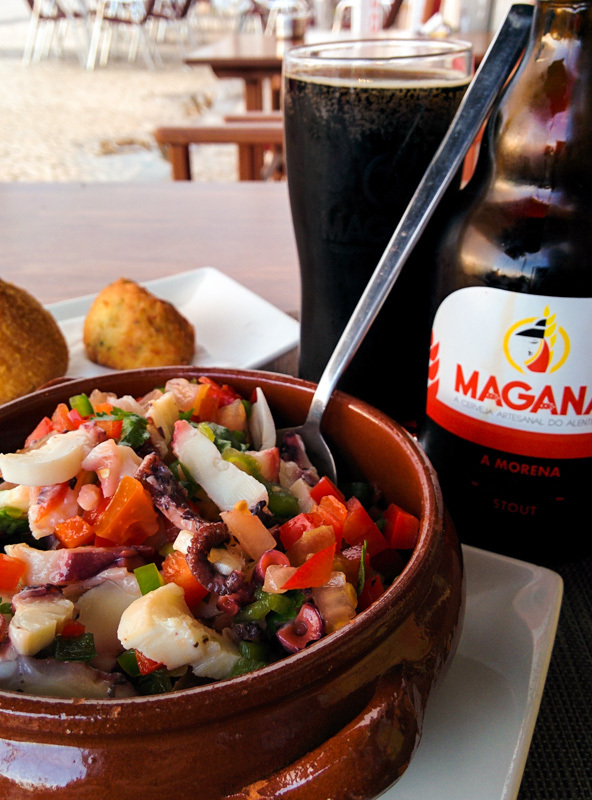 In my head Portugal is pretty much equivalent to seafood! Every now and again you however need a bit of changing-up in your meal routine. When I was having a few craft beers at Ground 864 I saw that they had some really interesting things on their menu. I’m a sucker for novelty foods so I had to try their bacon cheeseburger served on a glazed donut. Yes, you read that right! 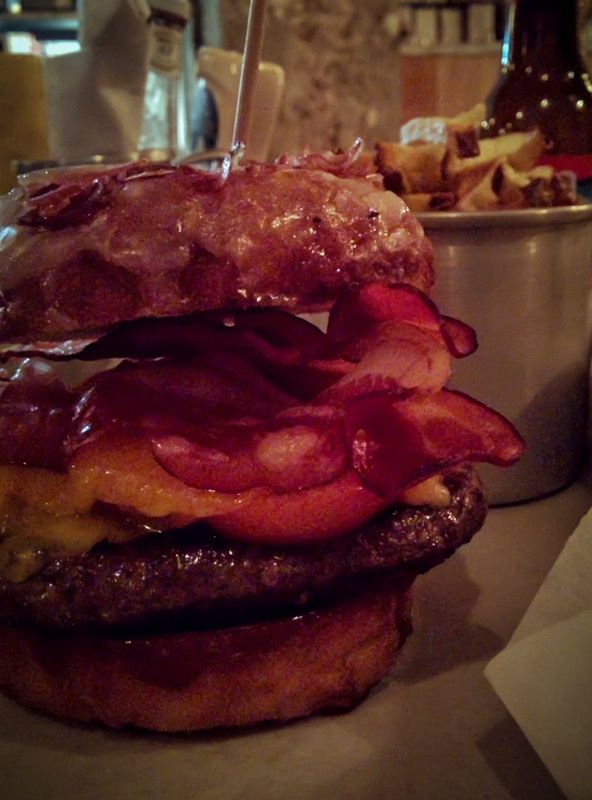 A burger on a glazed donut – and the glazed donut had crispy bacon bits in the glazing! The burger was cooked to medium-perfection and I have to say: A donut makes for a pretty good bun! Can’t get much more American than this: Bacon cheeseburger on a bacon-glazed donut! And then there is always the local McDonalds menu: I’m not really keen on the golden Arches and barely ever eat there back home. But when I’m on vacation the local menu is always still intriguing to me. There was a CBO burger on the menu. Mhm, what could CBO mean? I actually had hoped for one giant fried onion-ring as ‘cebola’ is Portuguese for onion. 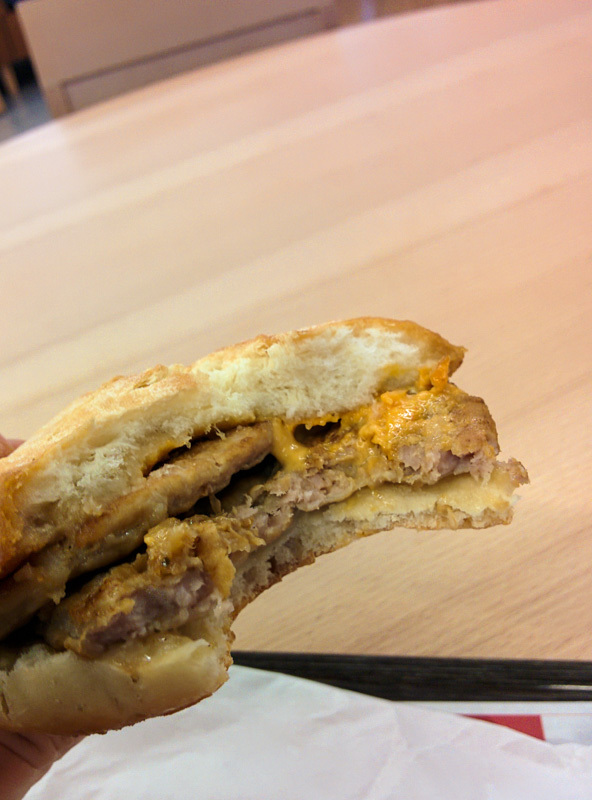 When I got a regular old Chicken-Bacon-Onion burger I was slightly disappointed (especially by the bland taste…). 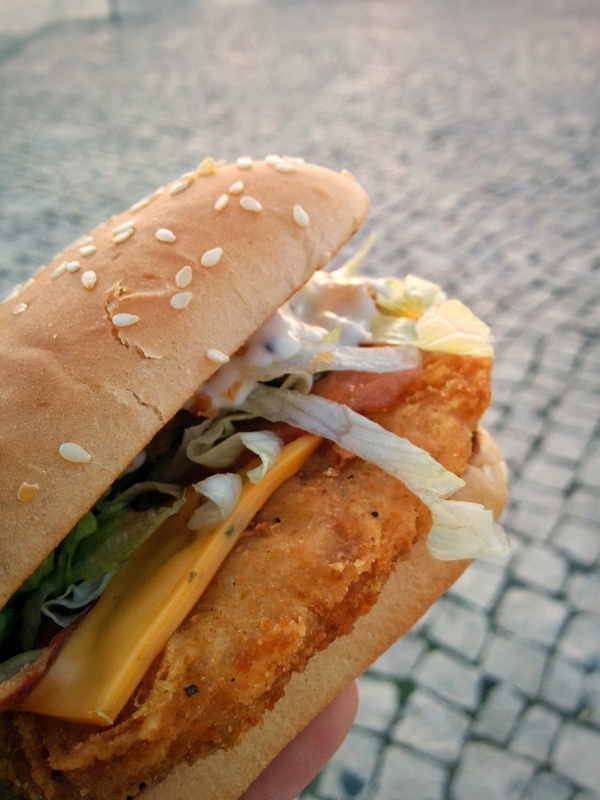 McBifana – McDonalds take on a traditional Portuguese bifana steak sandwich. 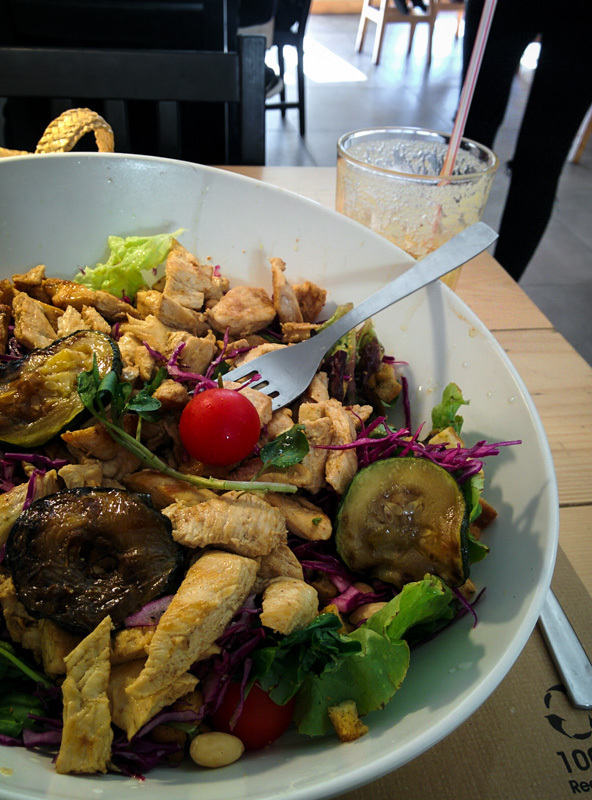 Meh, it is exactly as tasty as it looks… But you need to eat something when stuck at the airport for 7 hours, right? 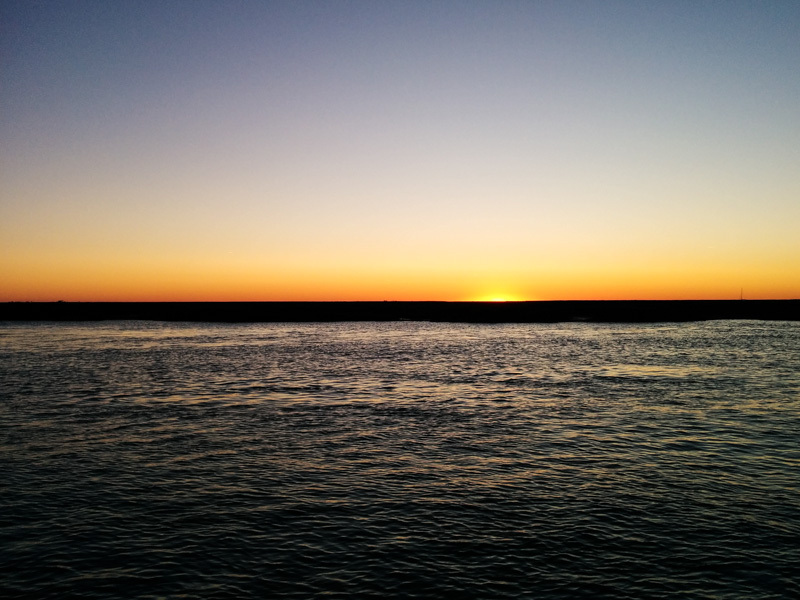 So what do you do 10 days in Faro?! 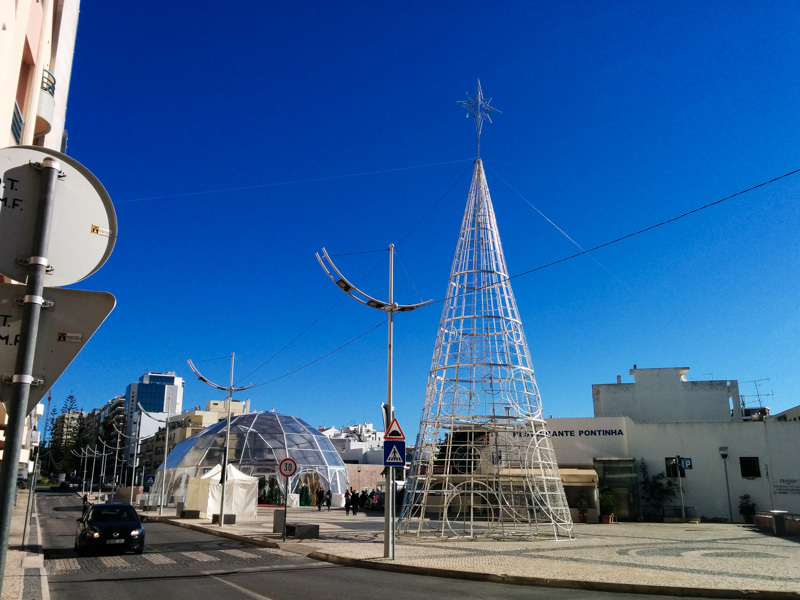 For most tourists Faro (especially in winter) is just a stop-over on their way to either Lisbon or Spain. For me on the other hand it was the actual destination of the trip. 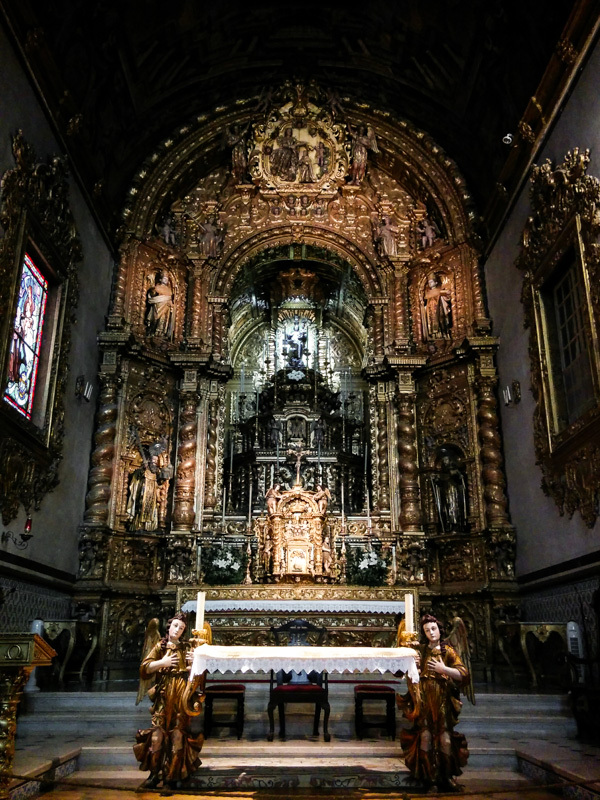 Every time I talked to other tourists they were asking me ‘So, what do you do 10 days in Faro?!”. Well, for me this vacation was all about seafood, relaxing and getting my mind off things. A nice little break in a warmer part of the world to get myself ready for the gruesome cold winter in the Netherlands and Germany. 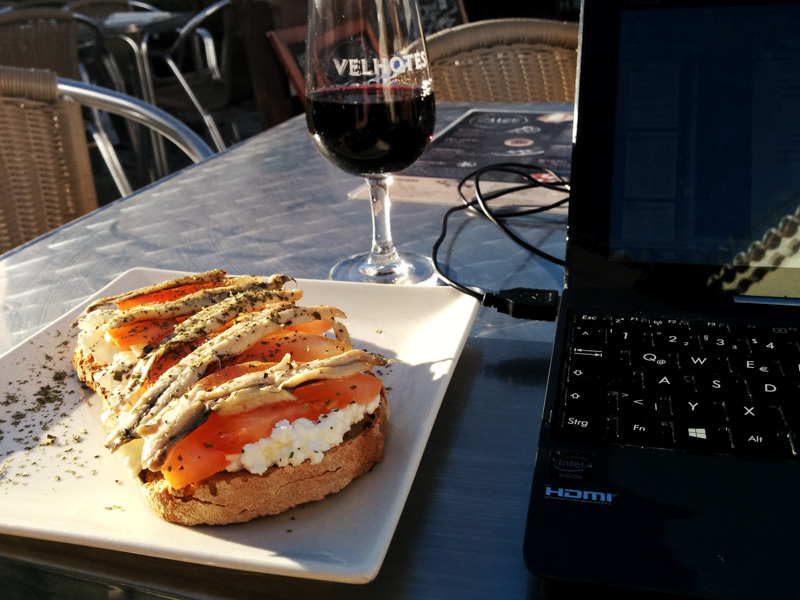 I spent most days going to the market, hanging out in cafés and bars, wandering around in the streets, working a bit and just enjoying the good life. I don’t know why but somehow all doors with locks on them are somehow intriguing. What are you hiding?? Luckily there is more colorful and cheerful stuff growing in the streets as well. Orange, anyone? 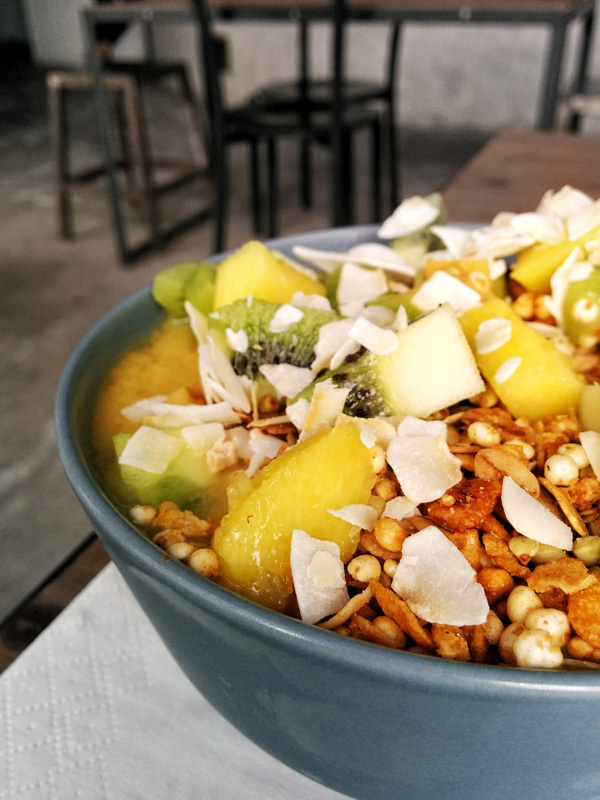 “Have a nice day” smoothie bowl for breakfast: Mango, pineapple, banana, kiwi, toasted coconut and crunchy granola! Big ol’ salad to keep my veggie intake up! This was seriously the first time in my life that I struggled to finish a salad. That thing was huuuge! 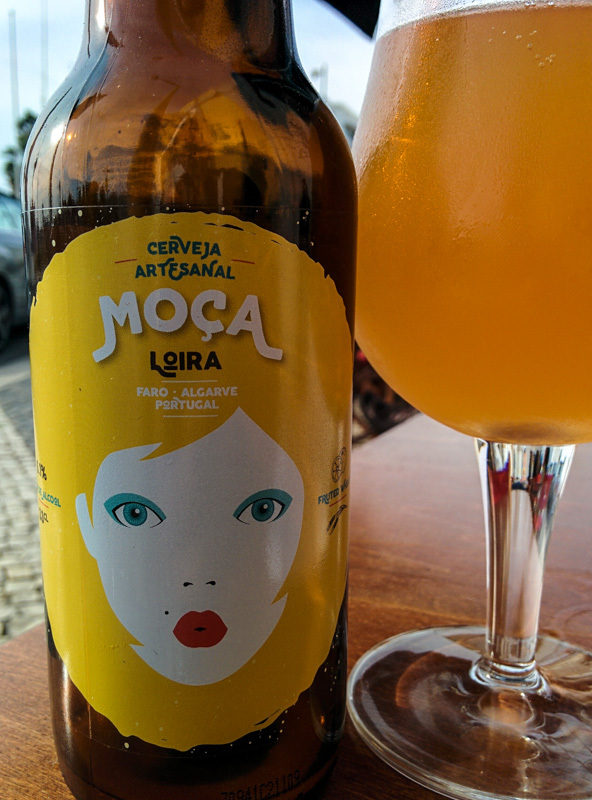 One thing that I didn’t really expect in the Portugal was the wide selection of craft beers. 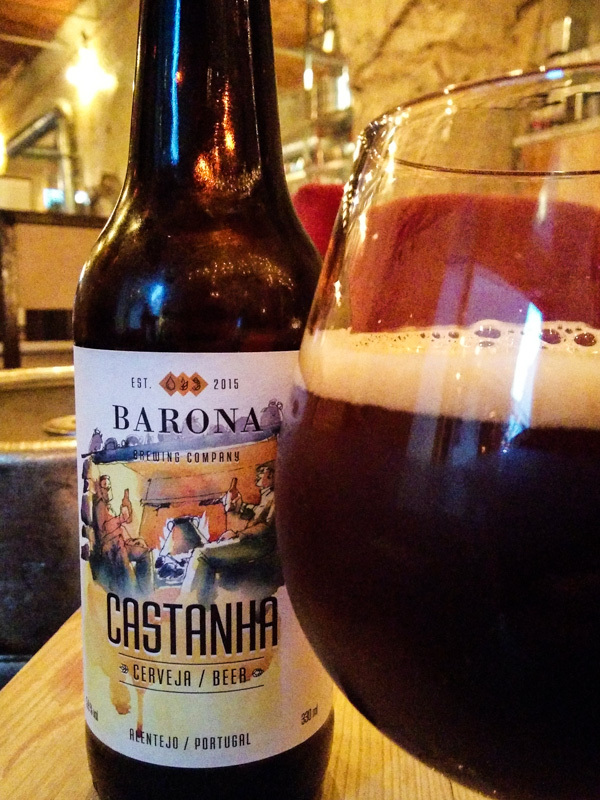 Either I completely missed this in Porto and Lisbon or my mind just revolves even more around beer than it used to in the past. 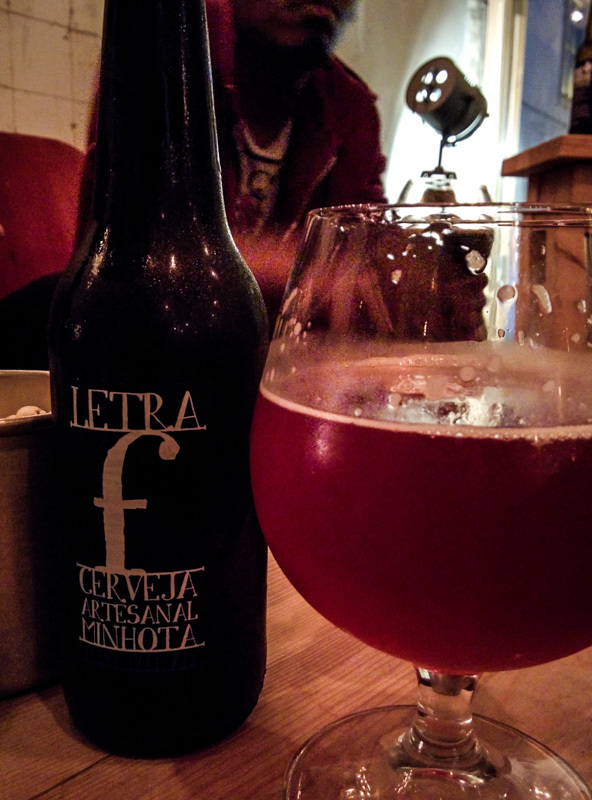 Faro has two awesome craft beer bars conveniently located pretty much next to each other. 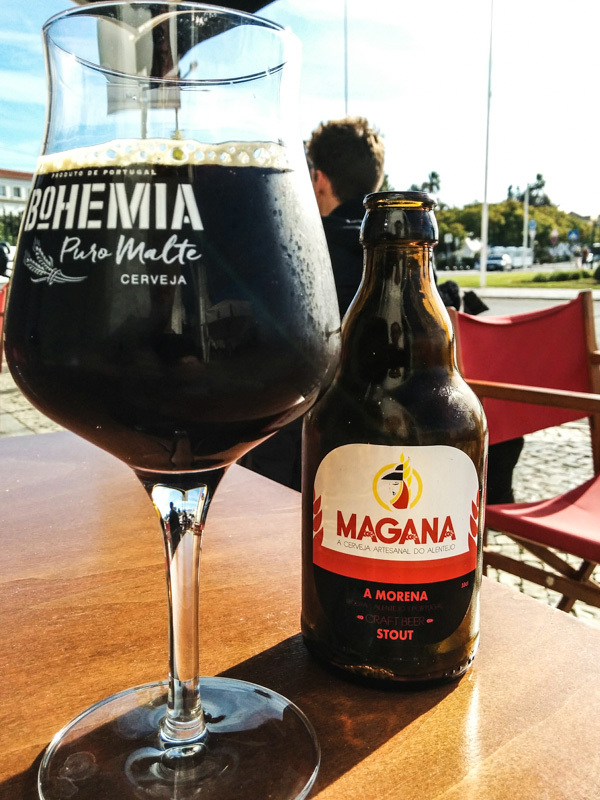 Ground 864 has a broad selection of local as well as international craft beers, whereas Boheme focuses primarily on local Portuguese micro breweries. If you just cross the street and the owner of the bar greets you and asks you when you’ll drop by again, you might have been to a place too often already. 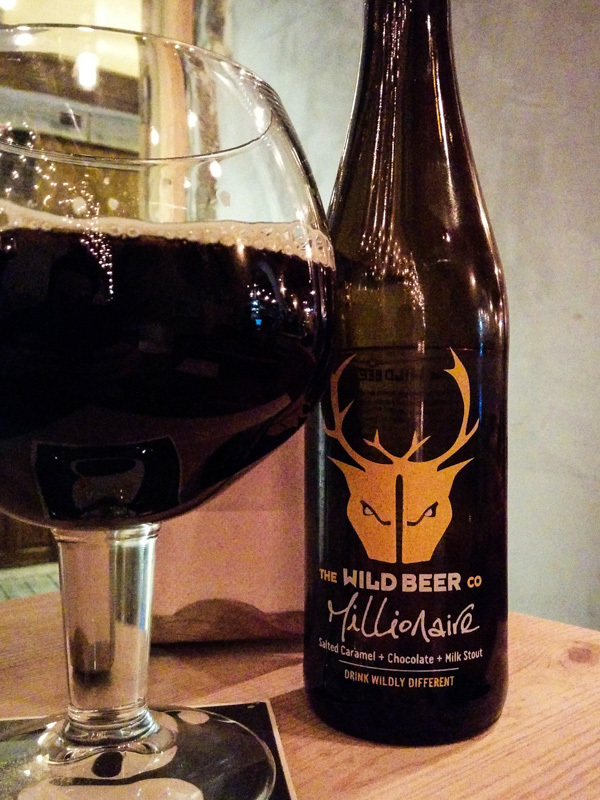 Both places have an awesome selection of beers and the staff is really knowledgeable as well. 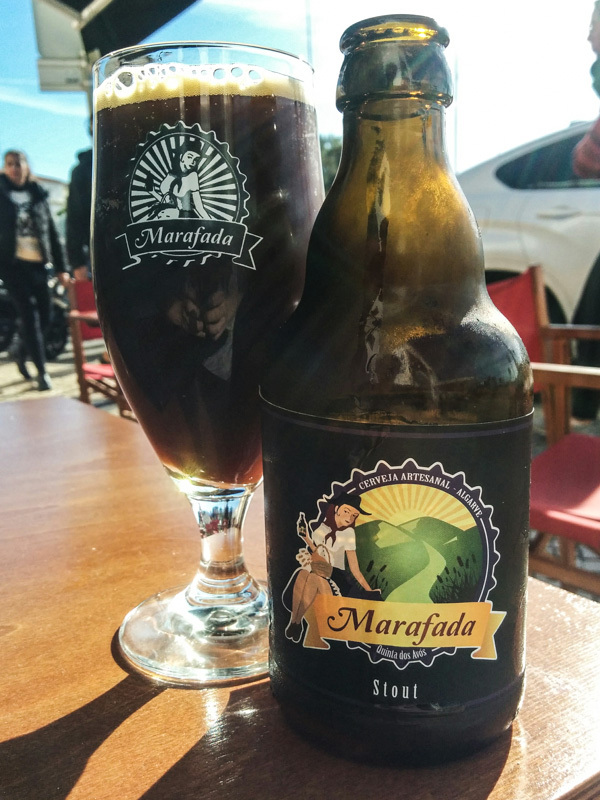 My recommendation for both places: Ask the staff for advice instead of going through the menu because their different bottles of beers are sometimes in short supply. We played the ‘do you have this one in stock?’-game a few too many times when we were there. 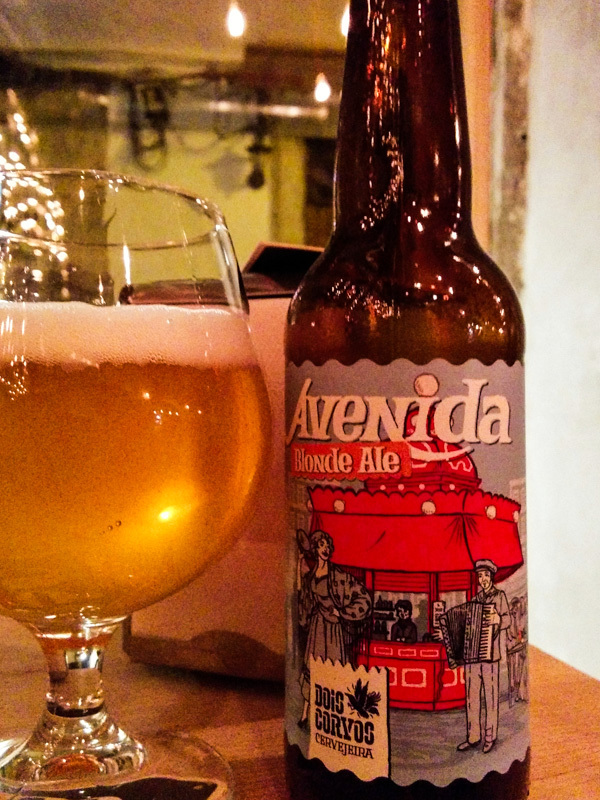 I truly put my taste buds to the test and sampled as many local delicious brews as I could. 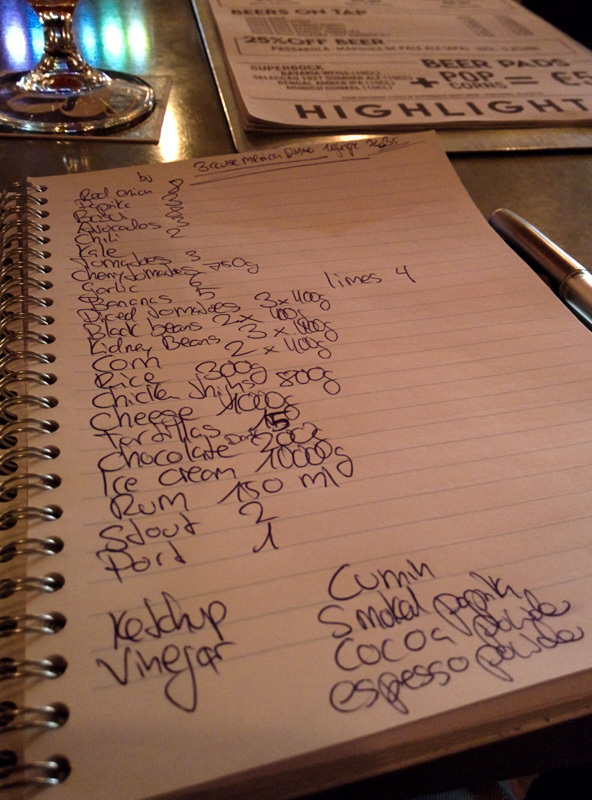 Just to make sure there was nothing more on the menu for anyone else to order. 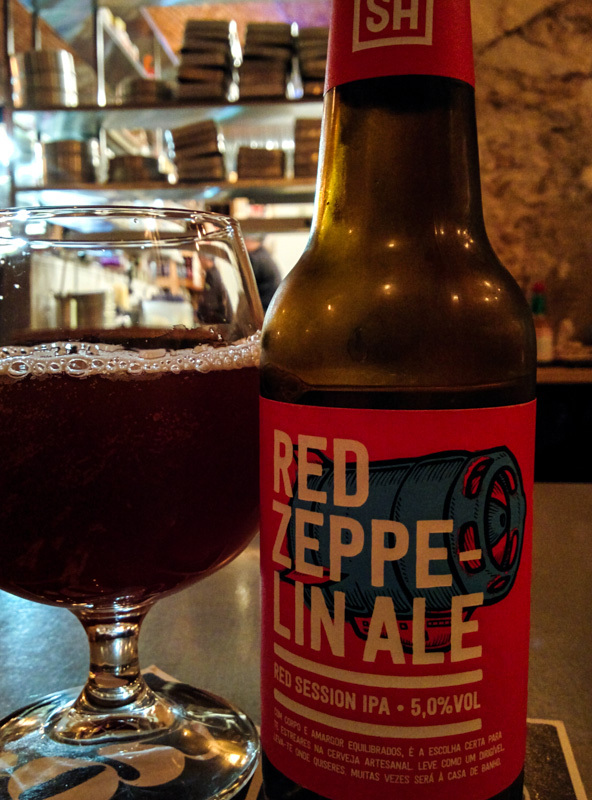 This beer was my favorite brew of the whole trip! 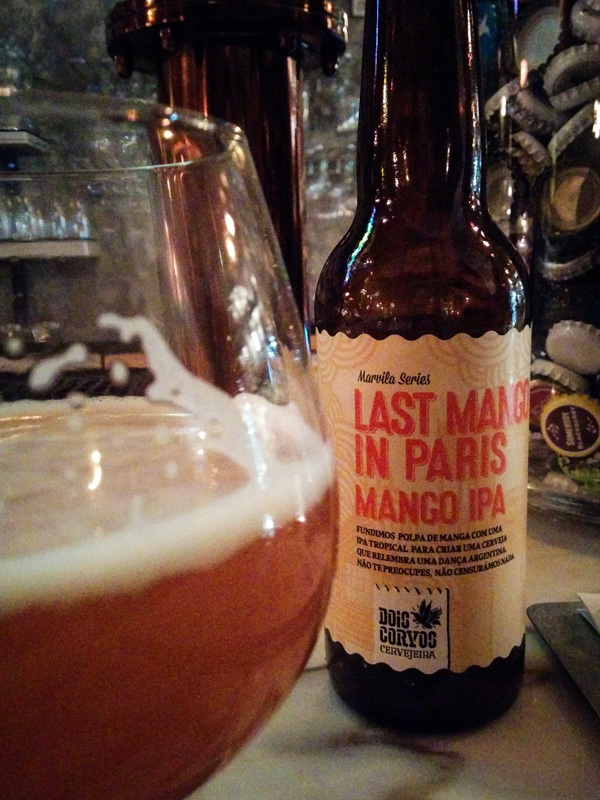 Usually not a big fan of IPA, but this one was had a really soft mango fruity taste to it. 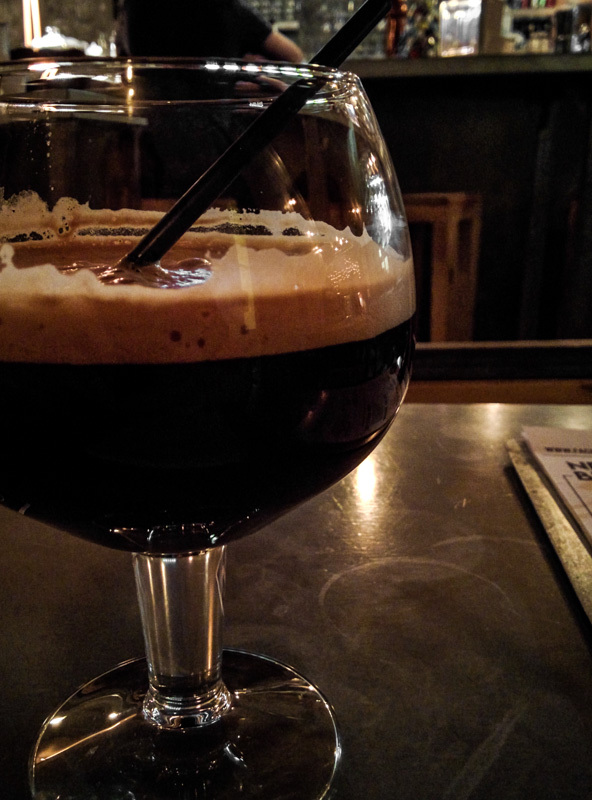 Espresso stout cocktail with coffee liquor, espresso and stout beer. So good! 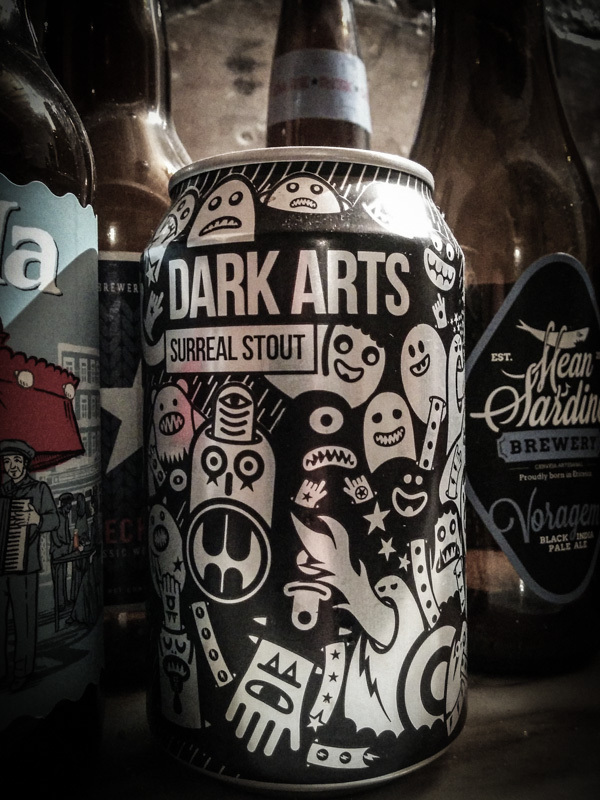 This one was sold out unfortunately, but I love the can! When I was ready to pack my stuff and move back to the cold fate had a little surprise in for me. There was a snow storm brewing up over Amsterdam meaning that my flight got cancelled five hours before my planned departure on Monday. 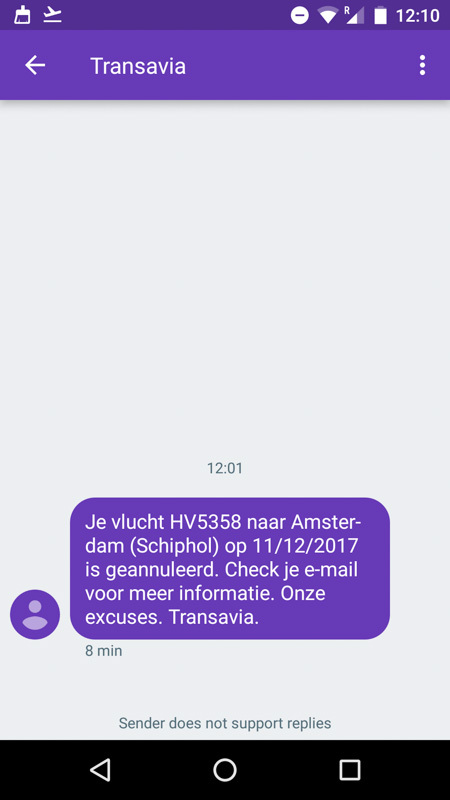 Unfortunately I had literally checked out of my hostel when I received the text from my airline Transavia. 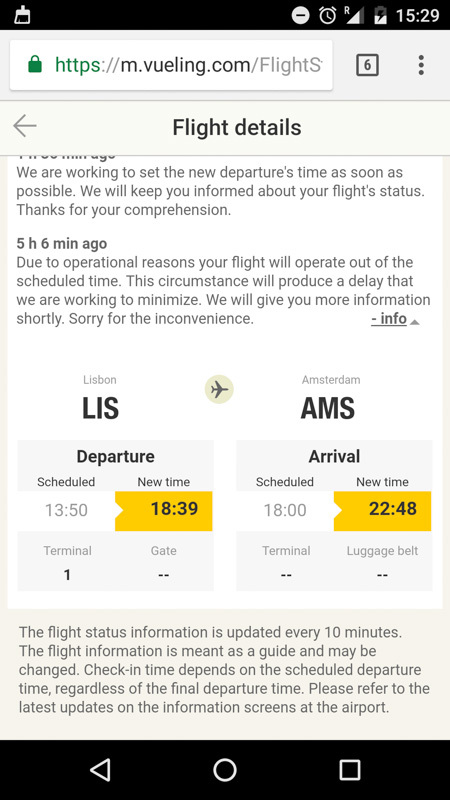 Their next available direct flight from Faro to Amsterdam would have been on Saturday. 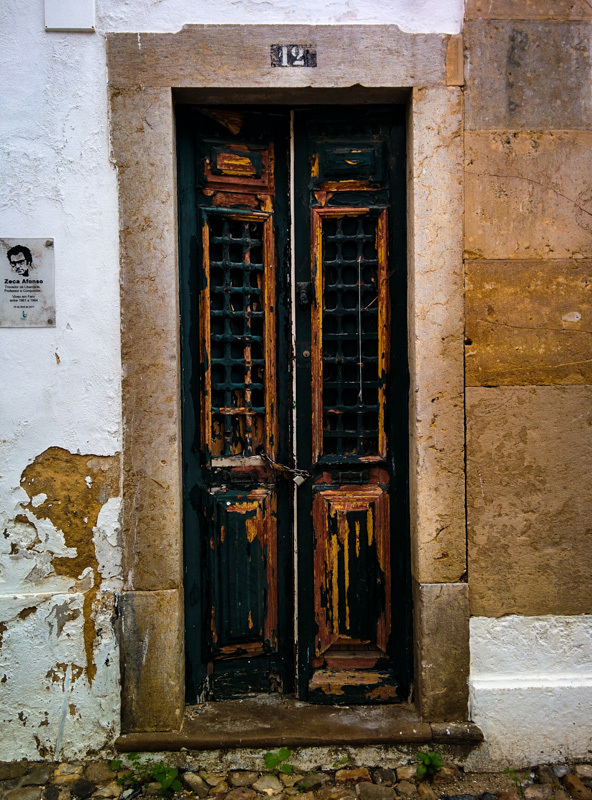 Even though I would have loved to stay another five days in Portugal unfortunately there was work to be done at home… I booked a new flight from Lisbon airport the next day meaning I would need to take a four hour train trip from Faro to Lisbon the next morning. 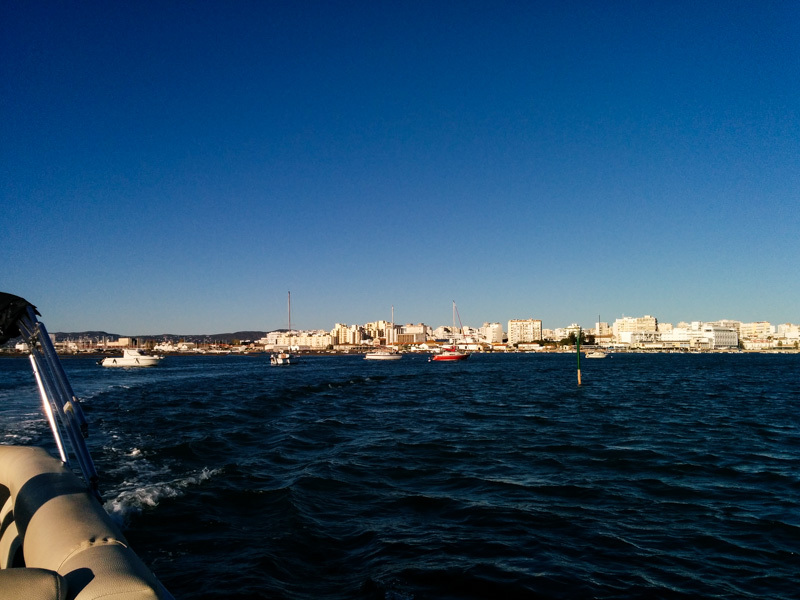 Still, that meant I had another fun night to spend in Faro. 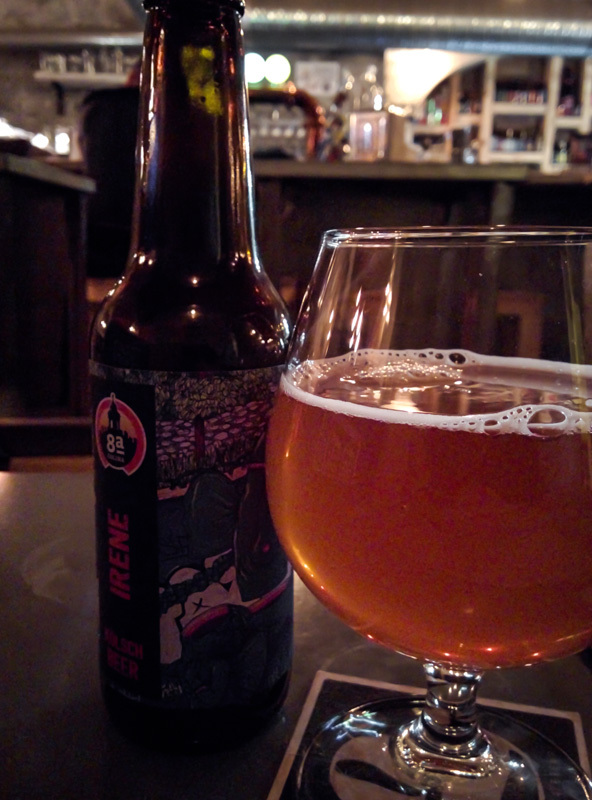 Even though the weather turned a bit windy we went out once more to Fabrica at night. I need to stay another day? 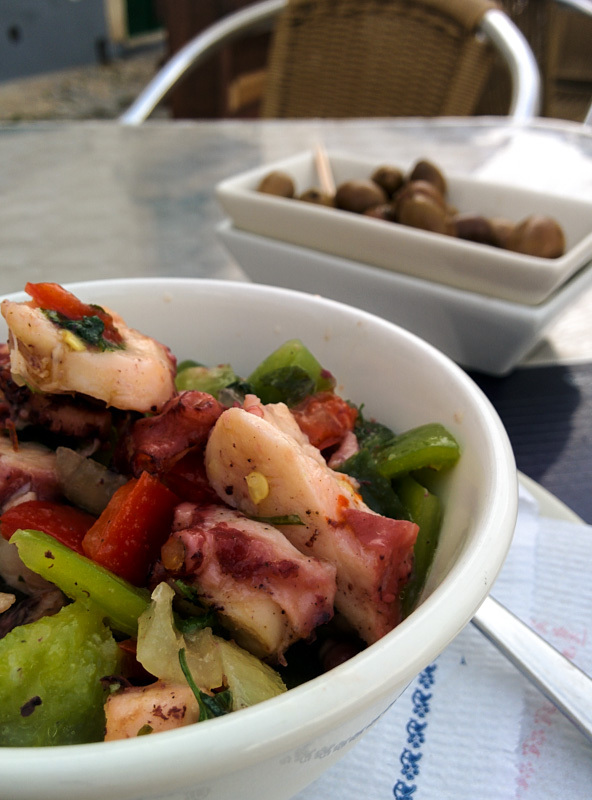 Guess that means another round of octopus salad and craft beer for me! My goal for this year was to travel 8 times for pleasure and I made that goal! I visited so many great places – a lot of which I had never thought of going to before. Portugal (Porto), UK (London), Asia (Hong Kong, Japan, Singapore), Poland (Katowice), UK again (London), Hungary (Budapest), Slovenia (Ljubljana) and now Portugal again (Faro). On my travels I met so many awesome people and have all those shared fun memories. It was really a great year but truth be told, it was also exhausting! Because of all the traveling I had less time to spend with family and friends, all those long weekends with all those broken work-weeks were draining. The year was a fun adventure I enjoyed every minute of it. Still, I don’t think I’ll repeat this little challenge in the soon future again. I would love to travel to Asia once more next year, this time to Thailand and Vietnam. Let’s see if I can constrain myself to lesser but longer travels next year! You will of course find all the (food) photos here! 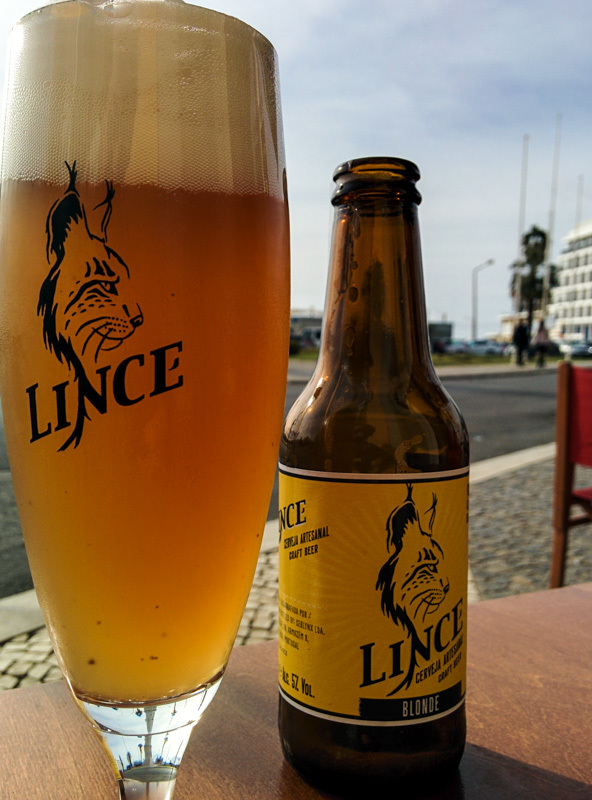 a very accurate description of our awesome trip to Portugal!